The land along the Arizona-Utah line is a geologic fantasia, a place where ancient sandstone has been swirled and twisted into bizarre and mesmerizing shapes by wind and water and time. Scattered throughout the landscape are some truly amazing vistas. Some are hard to get to, requiring long drives, challenging treks or backpacking permits. Others, though, are easy to reach. 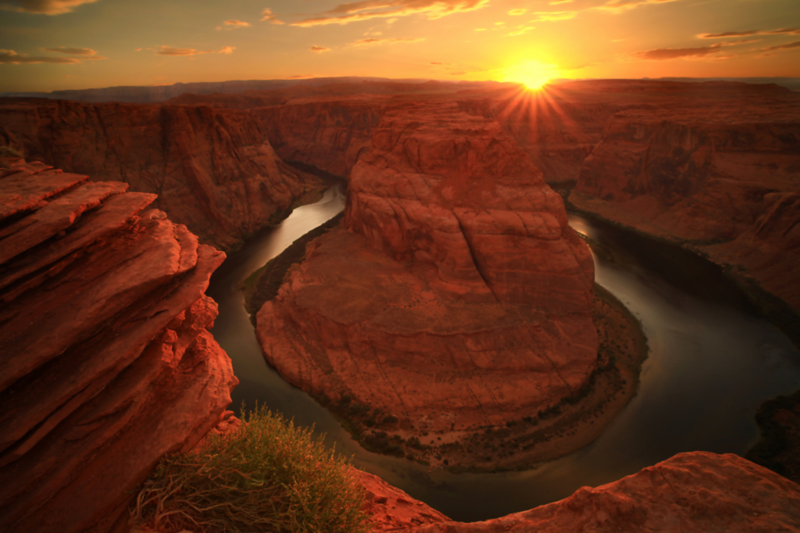 Consider the Horseshoe Bend Overlook, just a few miles south of Page in Arizona. Tamed by the Glen Canyon Dam, the emerald-green Colorado River makes a gigantic bend more than a thousand feet below the overlook, swinging first to the east, then curving back to the west. It’s a spectacular place, where shadows shift by the minute and new details drift constantly into your awareness. Orange cliffs, green water, sky… dazzle the senses as the Colorado itself, shimmering 1,100 feet below the overlook, is hypnotic.